I was recently asked to give my opinion on ICT in the Malaysian classroom for a research paper. I think it'll be good for me to share my thoughts with the world & I would appreciate the sharing of any of your thoughts too. 1. What are the advantages of the use of ICT in teaching ESL? How does the computer promote students’ writing in ESL? The advantages of ICT are numerous. Electronic Realia. With ICT you can show them videos, play sounds & display engaging pictures or mindmaps to help them internalise their learning. On writing with computers. Children are into new toys & working with tools. I think the prospect of writing with a new tool besides the mighty pencil would be a rare treat for the child who is naturally curious & inquisitive on technology. 2. What are the disadvantages (problems) arising from the use of the ICT in teaching writing in ESL? The disadvantages are just as numerous. Long preparation time. 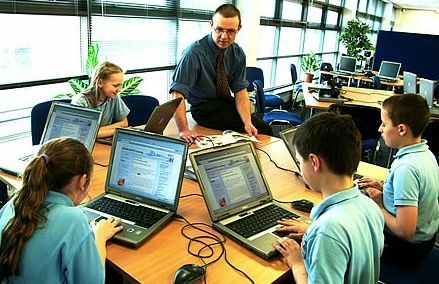 Teachers may not have the liberty of preparing an ICT lesson for every period because they are also tied down with numerous other responsibilities. Poor PowerPoint skills. Some teachers fill in too much information onto one PowerPoint slide when a mindmap or any other graphic organiser would be better & faster for understanding. Poor lesson planning. Even though interesting, sometimes the ICT tools do not match the lesson objectives. Exp playing a video on verbs when you want to teach adjectives. Students may be off task. If students have a computer in front of them, students might explore the computer instead of listening to you. High costs & learning curve. Teachers will have to foot the cost of the necessary software & the cost of learning how to use it. 3. How do the teachers manage the problems surrounding the use of ICT in the classroom situation? What advice can you give about using the ICT in teaching writing in ESL? Keep things simple & do what you know. If you are not very good with the computer. Just put some important items like pictures on the projector & do the rest on the blackboard. Combine all your resources, ICT & conventional. 4. How do teachers plan activities to make the best use of the ICT in teaching writing? What online resources do you like to collect for your teaching of writing? How do you use CD-ROMs and the internet if at all? Show them the basic concepts in mindmaps. I think ICT is very useful in showing students a graphical form of information which will probably embed itself in their brains for a long time. Show them some engaging pictures to get them generating ideas for writing. Online resources: images & samples of writing for analysis. Free content is everywhere to be exploited. 5. What are the implications for the role of the teacher in the use of ICT in teaching writing? How do traditional teaching methods have to change in response to the use of ICT? What’s the challenge for teachers using the ICT in teaching writing? Teachers have to play an active role in acquiring & improving their knowledge & skills on ICT. The future will bring more integration of ICT into the classroom & teachers need to be prepared & open to it. Traditional teaching methods don't have to be abolished. They can be combined for maximum effectiveness based on learning objectives, time for preparation, resources available, teacher skill & student ability. Not everything can be taught with ICT & not everything should be. I think the main challenge for teachers that exists today is the struggle to use & get used to ICT. In time & persistence, teachers can improve on this. 6. In what ways do teachers think the use of ICT will develop in teaching writing in ESL in the future? It largely depends on how proactive & enthusiastic teachers are. ICT has already been used to 'teach' in several of Malaysia's smart schools. But teachers around the world have already started to get their students to produce blogs, wikis & other websites to make writing more relevant. I can see Malaysia going in that direction too... eventually.